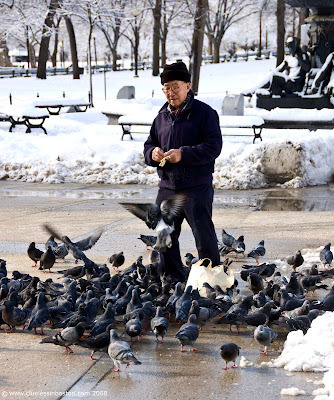 I know some in the DCPB community are anti-pigeon and consider them flying rats, but they are rather innocuous creatures and this old guy was having a great time feeding them. Innocuous? No, no. Their droppings spread disease. a shot with atmosphere! cheers! That's a great photo, I really like it. Thanks for visiting me on Glasgow DP. I imagine that this gentleman finds purpose in feeding these pigeons. It is a wonderful photo.